Sunday, May 14 from 9:30 a.m. until 4:00 p.m. 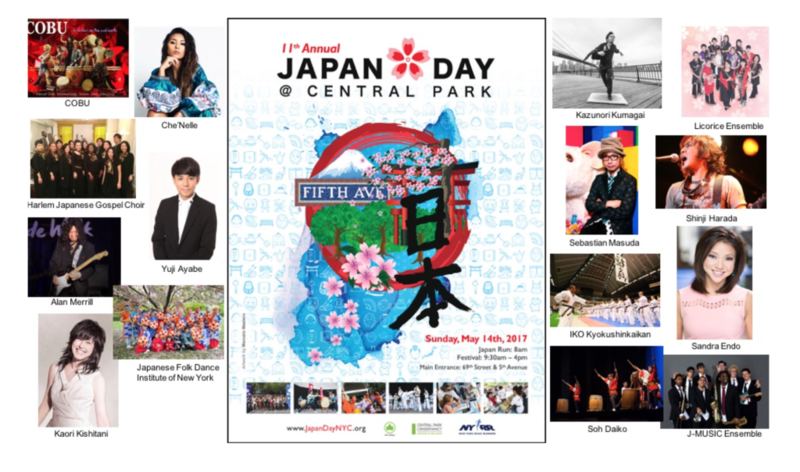 The 11th Annual Japan Day @ Central Park is brining Japanese culture to New York this Mother’s Day! It’s a festival that celebrates the diversity of Japanese culture through food, activities, and performances and has something for everyone of all ages. The activity tents open at 9:30 a.m., where you and your family can enjoy learning Japanese words and phrases, calligraphy, and origami. You can have your face painted to look like a Kabuki character, play YoYo Fishing, try on yukata, and master the kendama, a traditional Japanese toy. Everyone, from beginners to advanced players, is invited to watch the demonstration on how to play Japanese traditional board games, Shogi and Go. If you like trains and technology, you’re in for a treat. You can try on a Japanese railroad conductor’s uniform and learn what it’s like to drive a bullet train on JR Group’s simulator, and you can see a model of JR Central’s latest Rolling Stock “Series L0” Super Conducting Maglev. Visit the Fujifilm instax photo booth to get your one-of-a-kind picture taken with an “instax” instant camera, and watch them develop instantly! You can also meet the character Mashika-kun, a square deer that will star in Fujifilm’s TV commercial in Japan. Celebrated Japanese fashion icon Sebastian Masuda, the Ambassador of Kawaii and the founder of 6%DOKIDOKI, will display his Teddy Bear sculpture, part of his ongoing art project Time After Time Capsule. Masuda invites the public to contribute cherished personal items or create colorfully decorated items to fill the sculpture, which will travel around the world. A workshop and donation event will be conducted by the artist as well. Masuda is also served as a special juror in the Japan Day Art Contest 2017. This year’s winner is Brazil-born 3D artist/animator Marcelo Maziero, who has worked for ABC News Good Morning America since 2009. He has studied Japanese language and culture since 2014, which shows beautifully in his winning artwork. Japan Day guests will be able to view Maziero’s piece as well as the works that received Honorable Mentions, at a special ceremony during the event. Of course, it wouldn’t be Japan Day without Japanese food. Several vendors will be serving gyoza, okonomiyaki, onigiri, Japanese snacks, and Japanese tea. Former NY1 reporter Sandra Endo hosts the exciting performances onstage. Feel the energy of traditional dances, taiko drumming, a karate demonstration, and much more. Founded in 2007, Japan Day @ Central Park is an annual event designed by the Japanese community of New York to promote a deeper understanding of the Japanese culture and to say “Thank you, New York!” It has received official support by the Office of the Mayor, the New York City Department of Parks & Recreation, the Central Park Conservancy, New York Road Runners, the Consulate General of Japan in New York, the Japanese Chamber of Commerce and Industry, The Nippon Club, and many other Japanese and American corporations. The event kicks off with the rousing Japan Run, a 4-mile mini-marathon and Kids’ Races, hosted by New York Road Runners. The event continues with the Japan Day Festival featuring wide range of Japanese traditional and family-friendly activities, free samplings of popular Japanese cuisine, and powerful stage performances throughout the day. 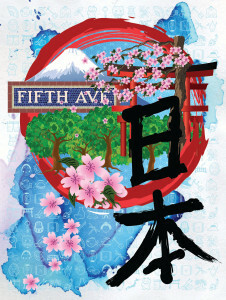 For more information, please visit Japan Day @ Central Park’s website.